Our Theme Winners are: 1st Place Theme Winner: Katlin A. Brown, 8th Grade, Memorial Day School; 2nd Place Theme Winner: Tavaris Williams, 6th Grade, Oglethorpe Charter School; 3rd Place Theme Winner: Ramondo Lee, Building Bridges High. The 40th annual celebration of Dr. King’s birth continues with our next events, the Business & Community Unity Brunch on Saturday, January 19, 2019 at 10:00 a.m. at the Savannah Convention Center. 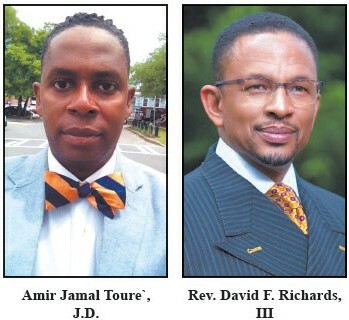 he Keynote Speaker will be Amir Jamal Toure`, J.D. The Citywide King Memorial Worship Service will be held Sunday, January 20, 2019 at 5:00 p.m. at the Historic Second African Baptist Church, Rev. Xavier L. Creekmur, Pastor. The Memorial Service Speaker will be Rev. David F. Richards, III, Senior Pastor of the New Hope AME Church, Atlanta, Georgia. Pastor Richards is the son of one of Honorees, Mr. David F. Richard, Jr. and the late Mrs. Swannie M. Richards. Universalist Church. This event is sponsored by the Unitarian Universalist Church in support of our scholarship fund. For additional information please call the Association’s office at 912.234.5502 or the president’s office at 912.341.0041.